The Hp Z3200 carriage belt replacement can take from 4 hrs. to several days depending how well organized you are. Carriage belt replacements are common with z series printers, z3100 and z3200 models. Step by step notes help to organize the belt replacement, notes by Mark Lindquist on replacing the z3200 carriage belt for DIY belt replacement. Find the right tools, materials and replacement carriage belt parts. It's kind of a mystery, when the Z Series printer belts will start shredding, actually. I think it has to do with usage, but I surmise infrequent usage can contribute, as the belt would just be sitting in one position under tension, creating stress at the cog driver and the tensioner pulley points. But humidity and temp play a factor as well. That rubber in those cheap belts has a mind of its own and will go soft when it will. The LPS belts sold online are apparently tougher and last longer. Some report belt changes are needed after 3 years, some after 5, but it varies from printer to printer. I begin working on my Z 3100 inch plain-vanilla printer when the belt finally broke. Shredded belts or the "dreaded shredded belt" issue, as I call it, is The Achilles' heel of all of the Z 3100 (all Z-series) printers. 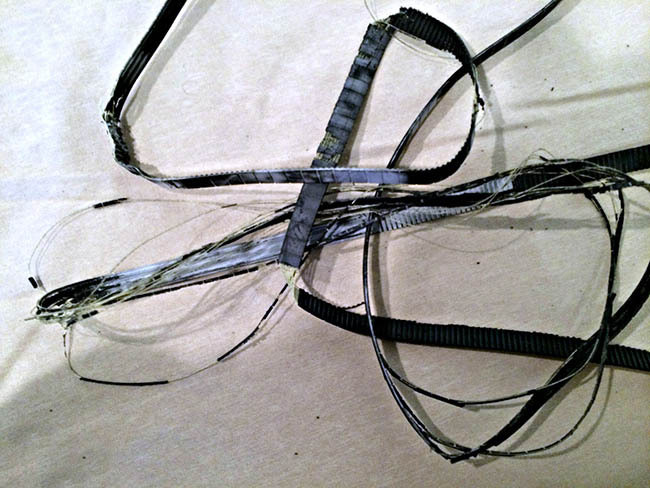 I recently replaced the shredded belt on a Z3200 24” printer that was given to me. Within hours of running it, the belt shredded (photo above). 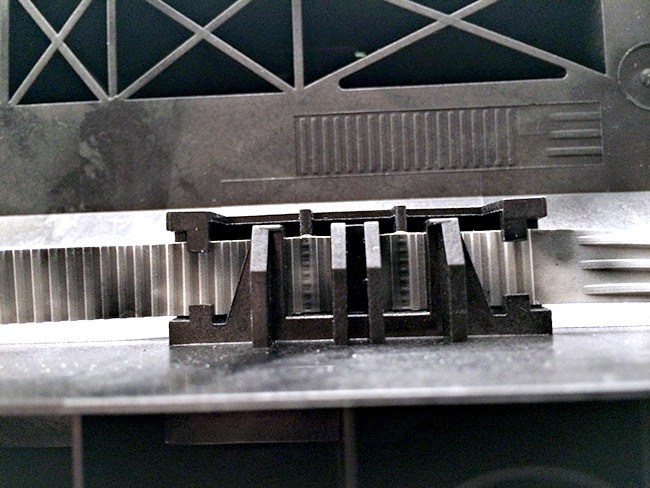 Underside of print head carriage depicting the belt fastening mechanism on a Z3200 printer. Positioning of the belt must be exactly as shown. take both springs out and disassemble the tensioning device. 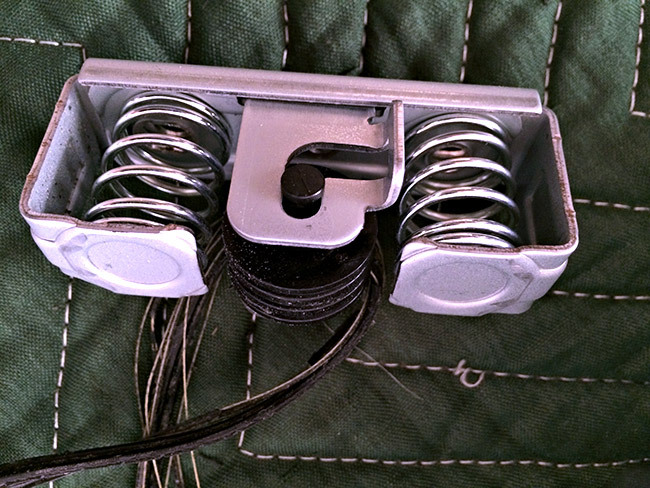 Very simple, and it saves cutting your new belt when putting it back together. 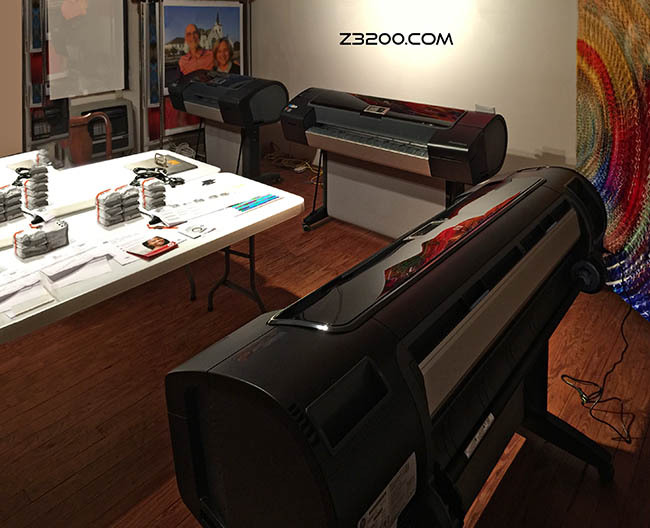 Doing a belt replacement on any of the Z Series printers is actually a big job and should not be undertaken lightly or by the faint of heart. Thankfully, Bryan Glynn (BGPictures, Tampa, FL) has made a video that details specifically how to disassemble the printer incrementally in order to get to the belt and several other places that may need a little work. I watched Bryan's video at least 4-5 times. He has a ton of good ideas, and suggestions. Watch his video several times. So equipped with your manual, your camera, and the wonderful video that was made to help you, just begin one step at a time, remembering that each step will carry you that much closer to your goal. Don't think of just accomplishing the task of replacing the belt however. Think along the lines of refurbishing your printer, and doing maintenance even if it means replacing some parts that may not immediately need it. An example is the rear carriage bearing and the power supply unit fan. Before you get started, a few folks on Luminous Landscape forum have mentioned that the carriage and belt can be changed out without tearing the entire unit apart as is discussed and illustrated in Bryan Glynn's video. "One thing I learned this time round is that you don't need to take off any of the top or back covers to work on the carriage and associated parts, just the end covers and the side plate at the left hand end of the carriage rail. You can disconnect the ink supply with the carriage over the service station, remove the clips from the trailing cable and out she comes. Bit more of a fiddle getting it back in but saves a lot of time, there are many screws in the top cover and ink tube guide rail...."
Actually, tearing the printer down as illustrated in the video is a good idea if you want to clean and inspect the printer for parts that are worn, extra dirty, or just need replacing. But if you are in a hurry, you can always pull the end caps if you know what you're doing. All in all, I recommend tearing the printer down and doing a super clean. That way when done, it's like a new printer. "To make things easier, I would release the print head from the parking station BEFORE starting to disassemble the printer by going into "printhead replacement mode" and then turning off the hard switch by the power cord. This allows you to easily slide the print head back and forth as needed. This gets rid of the need to do a mechanical release from the back of the machine later on." This is a good idea if your belt has not broken and separated. Once broken, you get an error message and can not get out of it. There can be no initialization of the printer in order to get back into the menu to go into printhead replacement mode. If you see the belt frayed to the point of breaking, it would be a good idea to bring the printhead carriage out of the parking station as discussed above by John, then simply unplug the printer. "Also, I found that it's not necessary to remove the plexi lid from the top cover of the machine, as the video instructions indicate. While taking off the cover was not much of a problem, trying to rehinge 4 plastic hinge pins on a 44" machine blindly was nearly impossible. I ended up taking the top cover back off the machine, so I could see how to properly seat the plastic hinge pins and after adding the dampers in hinge covers, I was able to screw them back together and then easily put the whole assembly back on the printer as one unit. Again, it's not necessary to remove this plexi lid--just remove the whole assembly, following the directions for removing the top cover." "MY Z3200 shredded its belt. I used the info on your website to replace it and have some notes." "1. While Bryan Glynn's video on changing the belt is excellent and well worth the time, it also has some mistakes about the LPS installation kit. Bryan complained that the kit doesn't include all the required tools. However, he appears to have failed to notice that the beg of "extras" included long T8 and T10 bits -- just the tools he says aren't there. Also, Bryan dismisses the "calibration media" as just a semi-gloss photo paper. It's not. It's an opaque plastic film. It's better for calibration because the photo paper expands when ink hits it; plastic does not. 2. LPS has its own belt-changing video: https://www.youtube.com/watch?v=P1SOr0tKLP4. I think it's worth watching both, but the LPS approach should be MUCH faster because it rightly bypasses a good deal of the assembly. Bryan missed a shortcut that is detailed in the service manual: If you are removing the top cover, there is no reason to remove the window. However, LPS video goes further: There is no need to remove the top cover. Skipping the extraneous steps shortens the disassembly time, the reassembly time -- and cuts the number of pieces that have to be kept organized. 3. The LPS video shows a shortcut for removing the tailing cables: Removal of a black plastic guide that sits on top of the tailing cables about in the middle of the printer. However, Bob Wert just popped it out, making it seem trivial. Took me a while to figure out the trick: Remove both screws that hold the guide in place, then pull the guide toward you and then lift it up. It has clips that fit into the metal panel beneath it; you have to slide it forward before it can be lifted out. 4. I managed to break the rear carriage bushing while re-installing the carriage. I remembered that you had found an alternate source on eBay. Unfortunately, it looks like that is no longer an option. LPS has the OEM part for $23; a variety of suppliers in China are offering them for much less. (I ordered a replacement from LPS, but may order a backup from one of the Chinese suppliers.)" At the time Bryan made his video, either the two additional bits were not yet included in the kit from LPS or they were possibly omitted from the kit inadvertently. I have watched the LPS video, and admittedly, it is a quicker way to deal with the belt changing by NOT removing the top cover and pulling the whole printer apart down to the frame. Somewhat tight quarters, but doable. Also, Bob Wert makes no mention of the rear carriage bushing which is so very easy to break. Note in his video, that when he replaces the carriage, he has his thumb over the bushing, protecting it while sliding the carriage on. Wert's approach works fine, but is less thorough than Bryan's. The advantage to taking the machine apart down to the frame is that it enables a thorough inspection and a really good opportunity to clean the printer best. BOTH methods are acceptable. BTW - the calibration media included in the kit: meh - no big deal, IMHO. Just any Gloss or Semi-Gloss will do the job fine - no big deal. I'm with Bryan on this. Expect to spend 2-3 hours on the job, taking your time. One tip I forgot to show – while you have the carriage assembly out and are cleaning it, be sure to wipe clean the color sensor shutter mirror. It’s on the tiny trap door on the color sensor itself. It is often hazy and obscured over time which can fail the unit. Do not clean the sensor lens or emmiter underneath, it should not need it at all. DO NOT assume there are missing steps! If it’s not mentioned DON’T DO IT! That especially means do not try and relock the release screw for the carriage. I have done to my printers. I have made this web site mainly for my own benefit so that I have a record of what I have done. It is free for anyone to view. If you use this information do so at your own risk - I assume no responsibility for errors. If you find any links that are not working just copy and paste them into your browser. Some may be obsolete. Above: The Lindquist print studio with 3 HP Z Series printers, 3200 and 3200ps. set up in the photo - notice the ink and printheads on table.